* Please note that the Museum Collections will be closed 26 December 2018 - 3 January 2019 due to New Year Holidays. Bethlehem is said to be the birthplace of Jesus. The Church of Nativity in Bethlehem is mainly built on ancient architectures rebuilt in the 6th century, and one of the world’s oldest existing churches. However, it was heavily damaged and has nearly collapsed due to weathering over time and repeated conflicts. It was registered in 2012 as a UNESCO World Heritage site, the first in Palestinian territory. At the same time the risk of its collapse was of critical concern, and it was also registered on the list of World Heritage in Danger. Conservation and restoration work has been carried out by the Piacenti Restoration Center of Italy, which has extensive experience in these areas. 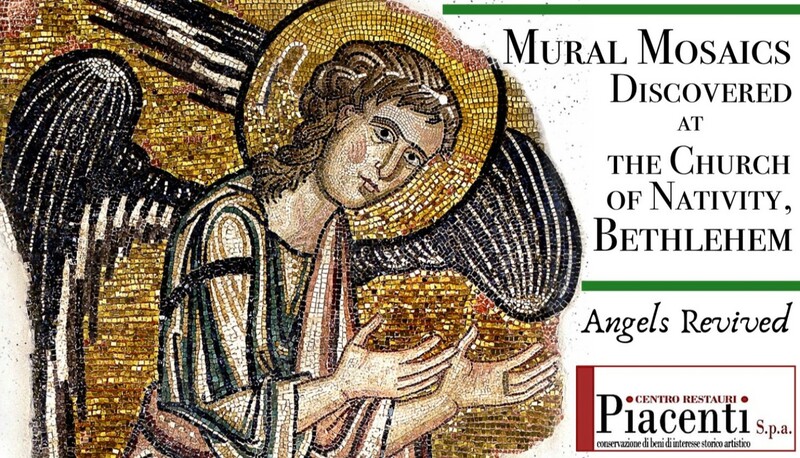 Mural mosaics depicting angels (c.,12th century), discovered under wall plasters in 2016 attract worldwide attention. In this exhibition, the museum will introduce the significance of preservation and restoration work by Piacenti and the many discoveries made during this work, using photo panels and a video show. Short guides in English, Korean, and Chinese are available from the museum reception. Evening Gallery: 10:00 – 20:00 on occasional Fridays when Evening Lectures are scheduled (admission up to 19:30). - Special Exhibitions require separate admission fees (visit each Japanese page for Special Exhibitions). - Free for Museum Members. - Elementary and junior high school students (with school ID) are free on Saturdays and Sundays (Museum Collections only). - Half price for visitors with disabilities and free entry for one attendant. For further information, please contact the museum reception. - Please refrain from any actions that may disturb other visitors or damage museum facilities. - Smoking and eating/drinking inside the museum are strictly prohibited. - Photographing the objects on display is not allowed without permission. - Dangerous items and pets are also prohibited in the museum (except service animals). 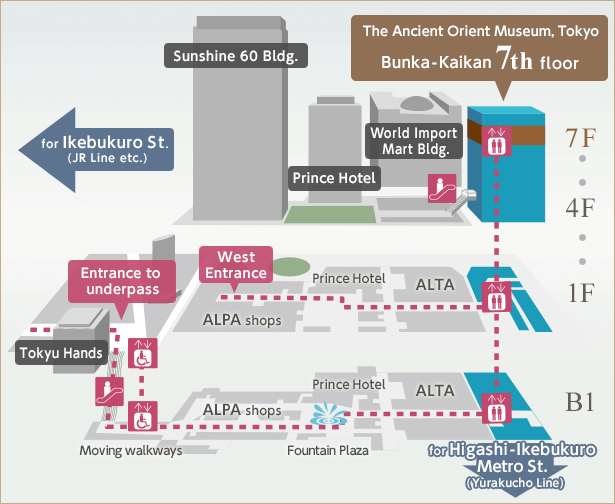 approximately 15-minute walk from Ikebukuro Station, East exit (JR Lines, Tokyo Metro subway, Seibu and Tobu Lines), or 6-minute walk from Higashi-Ikebukuro Station (Tokyo Metro Yurakucho Line), exits Nos. 6 and 7. Free of charge for students and staff who are affiliated with the following universities (please show your student/staff ID at the museum entrance): Kokushikan University, Sophia University, University of the Sacred Heart Tokyo, and Rikkyo University.